On Tuesday, July 31, Fauquier Hospital's Operating Room was a little more crowded than usual; it was the scene of an emergency preparedness drill that simulated an operating room fire and patient evacuation. About 15 volunteer members of the Rappahannock-Rapidan Medical Reserve Corps pretended to be patients during the exercise. At 4:20 p.m., strobe lights and an alarm signaled the start of the drill. The OR was full, with four simulated surgeries underway and patients in the prep area and in recovery. Within about four minutes, all patients had been moved to a safe place in the hospital. 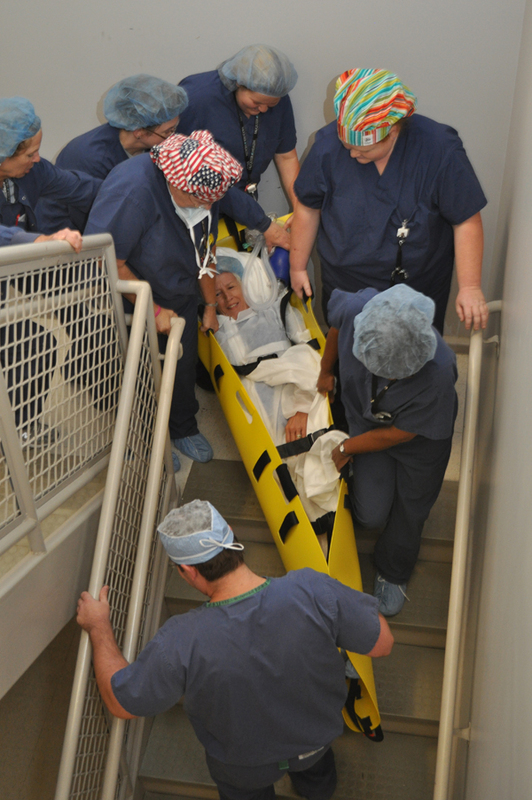 Because of the location of the mock fire, a patient in one of the operating rooms was carried down stairs using a new Med Sled. (If it had been an actual fire, the Med Sled would protect the patient while the Med Sled is guided down the stairs.) Minutes later, members of the Warrenton Fire Department arrived to put out the (imaginary) flames. During a discussion after the drill, staffers and volunteer patients offered thoughts and suggestions. Several volunteers praised the communication skills that led to the smooth operation, and appreciated that throughout the drill they felt like their safety was always the first priority for the medical staff. Fauquier Health periodically carries out emergency preparedness drills, testing healthcare workers’ response to disasters -- from tornados to epidemics.